When I say fall foods what do you think of? I think of poached pears, pecan pies and cranberry sauce… Then I thought, why not throw all of these ingredients together in the Vitamix to make one delicious drink? 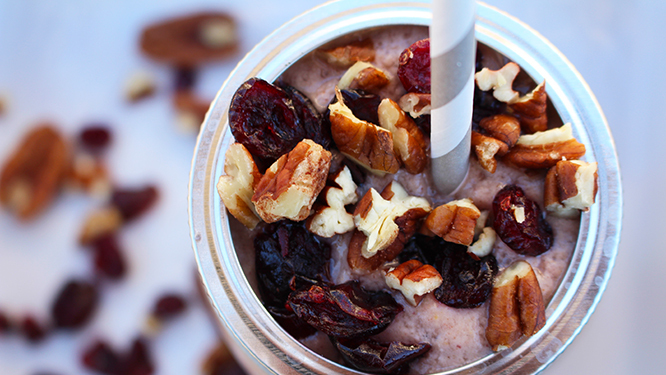 My Pecan Pear & Cranberry Smoothie Recipe, it’s creamy, sweet and good for you and it’s the perfect mid morning snack or afternoon sweet treat, with plenty of benefits! Cranberries – not to be confused with the 90’s band … zombies or anything that lingers these tiny but mighty fruits are high in nutrients and antixodants and have been deemed pretty beneficial for the old bod. Or the young bod … I don’t want to discriminate. These bountiful berries contain high amounts of phytochemicals called pro-anthocyanidins (PAC’s). Some studies have shown that eating these babies could have potential health benefits against cancer, aging and neurological diseases, inflammation, diabetes, and bacterial infections. For more information on berry goodness head on over to my Berry Goodness blog! It’s berry nice …. Nuts are all the rage. They are full of healthy fats, minerals, proteins and are a great on-the-go snack. You’ll be so on trend with this smoothie in your hand. Pecans are particularly great because they contain high amounts of fibre, boosting our heart health and our digestive health. Pecans are also rich in magnesium, which aids as an anti-inflammatory. They can help to strengthen our immune system which is perfect for those colder times of the year and If that isn’t enough to do the pecan can, because pecans are rich in vitamins A, E and zinc they help to keep our skin clear gorgeous, glowing and youthful! High in fibre, B2, C and potassium pears certainly do pack a punch for your health. Pears are said to be perfect for helping at preventing your risk of high blood pressure, the antioxidants fight free radicals to prevents cancer, they contain high pectin levels which lower our cholesterol and also keeps our digestive systems moving and grooving and … they are a super immune booster and a cooling food helping to reduce inflammation, particularly in the digestive tract. Cool ehy? For my sing-a-song buddies out there … pear juice is used in chinese medicine for it’s healing properties for the throat and vocal chords so if your suffering try drinking pear juice morning and night and you’ll be singing like a canary! For more Recipe Inspiration head on over and visit my good friends at Raw Blend. We want to see your recipe creations at home! So make sure you follow us on Instagram and Twitter@paigehemmis & #DIYeat!